I know some boys who are big into all things space but are especially interested in astronauts and I can certainly see why. It is exciting to think about traveling to space and exploring the universe. We wrote about non-fiction astronaut books earlier (see link below) and while we were searching for those books we ran across some fiction astronaut books that we have enjoyed and found some extras that we just had to share with you so here is your list. 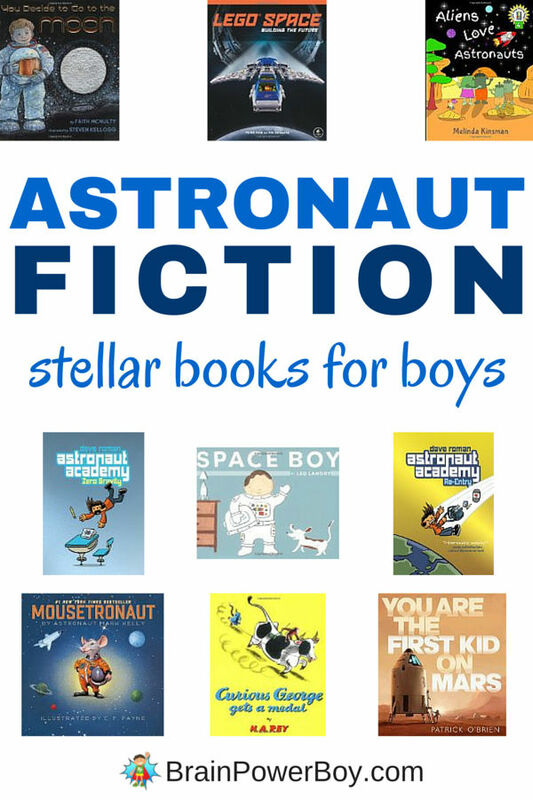 Grab these best books for boys for your space fanatic today. Leave a few of them sitting out or plan a space reading session. Have fun! I have fond memories of reading Curious George books to my son. What great stories. Curious George Gets a Medal is perfect for our list of astronaut fiction books. We love this for all of George’s crazy antics and how he ends up going off to space. Looking for a silly rhyming book with aliens and astronauts – this is it. Aliens Love Astronauts is a funny book that the preschool crowd will enjoy. If You Decide To Go To The Moon is a winner. I remember reading this with my son and we both enjoyed it very much because it has details but is a picture book and is very approachable. Mousetronaut is the story of a tiny mouse who wants to go into outer space. Since mice really did go to space on the Endeavour this book lends itself to interesting discussions. The little mouse just might be what they need to save the day when disaster stikes. What if You Are the First Kid on Mars ? What if you got a chance to actually live there? This fictional account of life on Mars for a 10-year-old boy gives one interesting things to think about. I would say boys around 7 – 10 would enjoy this title. I always find it interesting to see how kids end up finding something they like a lot. You just never know where the trigger is going to come from. Thanks for the comment Katie. I hope you space fan enjoys the books. I love Mousetronaut. It is one of our favorite to read at our house. My boys aren’t interested in space yet but I remember my students loved some these books when I was a teacher. One of my sons loves Curious George so we’ll have to check out the book you suggested. Thank you for sharing at the #Made4Kids Link Party!